Would it be possible? Yes. 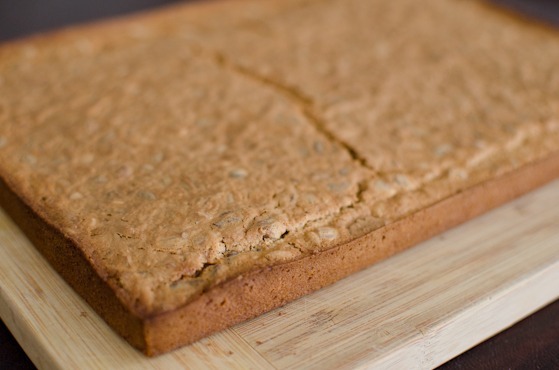 I want you to try these sweet rice cake bars. 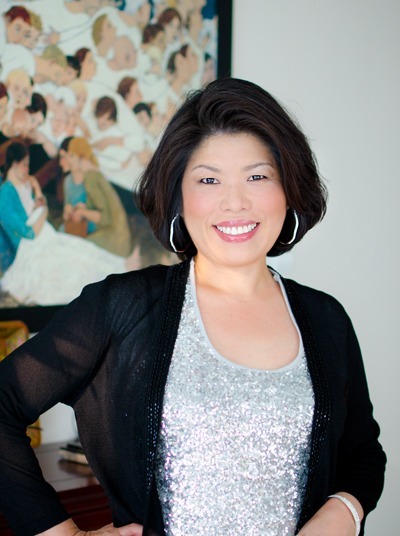 They originated from the Koreans living in Los Angeles, California many years ago. 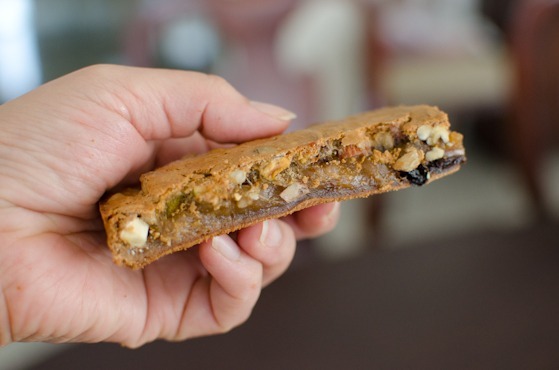 Their craving of traditional Korean rice cakes, which sometimes is hard to achieve in a home kitchen, turned this bars more like ‘east meets west’ version of rice cakes. There is no wheat flour nor any butter or oil, but still creates the crisp texture on the outside and chewy (almost mochi-like) inside. 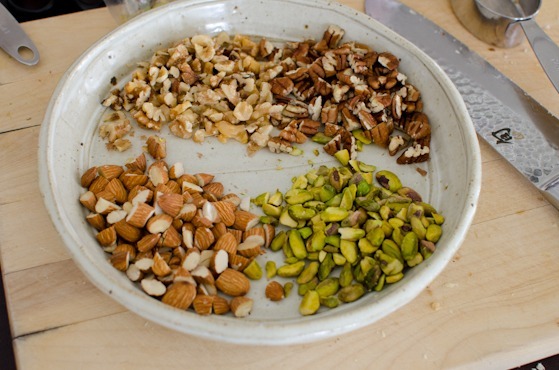 The filling can be adapted to any choice of nuts, seeds and dried fruits for your liking. You can adjust the amount of sugar depends on the sweetness you desire. 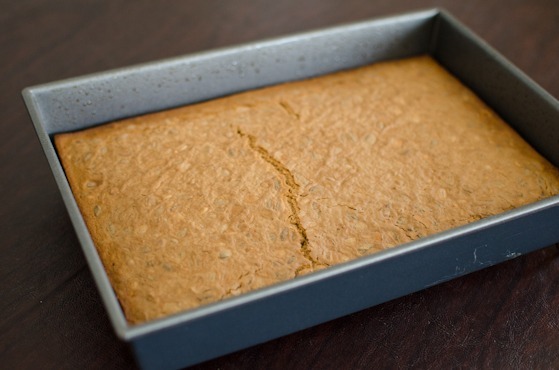 That makes this bars great for snacks, quick breakfast, and even a dessert. The best part? 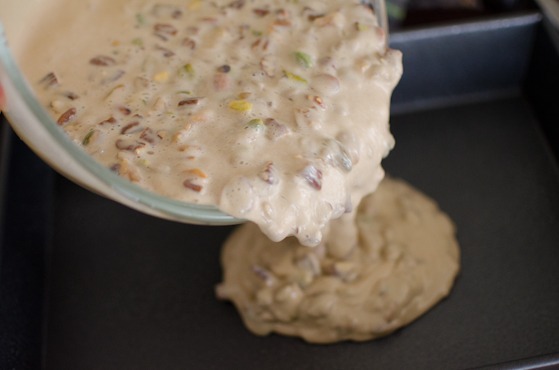 You can whip the batch in less than 10 minutes before you put in the oven to bake. 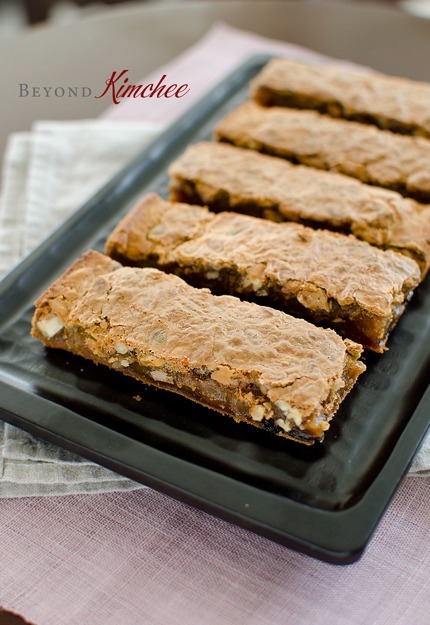 An easy, chic, gluten free, and low fat baked treat… Let’s do with the L.A Style!!!! Here are my chosen plant based (?) filling. 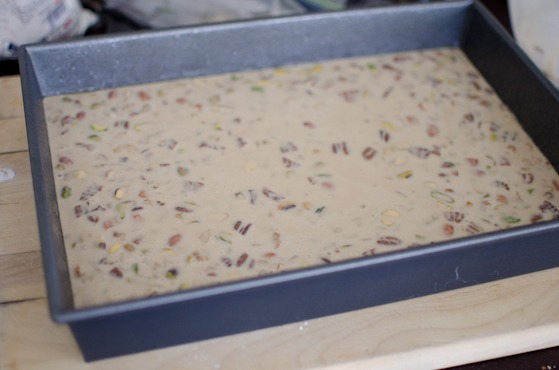 Walnuts, pecans, sunflower seeds, raisins, almonds and pistachios. 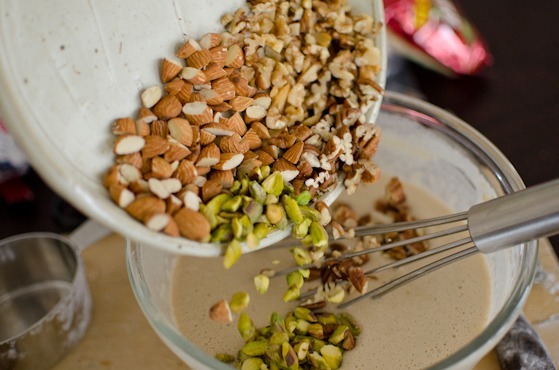 Use any nuts, edible seeds, and dried fruits. You can throw some chocolate chips if you like. 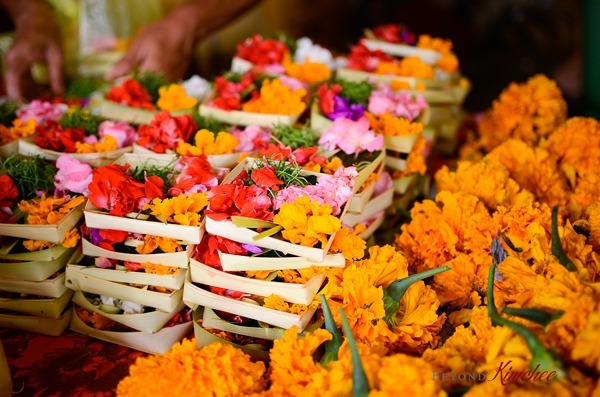 In a large bowl, mix rice flower, brown sugar, baking soda, and salt. I only used 1-1/2 cup of brown sugar for 3 cups of rice flower. It gave very subtle sweetness. If you prefer sweeter treat, add more sugar as you desire. 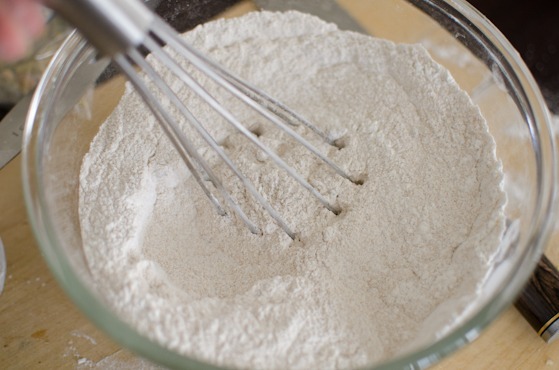 Pour milk to the flour mixture, add 1teaspoon vanilla, and mix until everything is well combined. It will be a thin batter. UPDATE: If using Mochiko flour, which is from short grain rice, you will need more milk to get the right consistency. 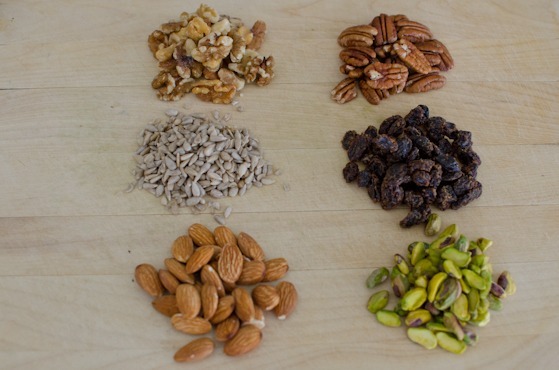 Seeds and dried fruits, and other wonders of nature if you like. Mix well. Pour on a well greased 9×13 pan. Make sure you even out the nutty goodness. Bake in a preheated 375F oven for 30-35 minutes. Make sure to cool down completely before you cut. 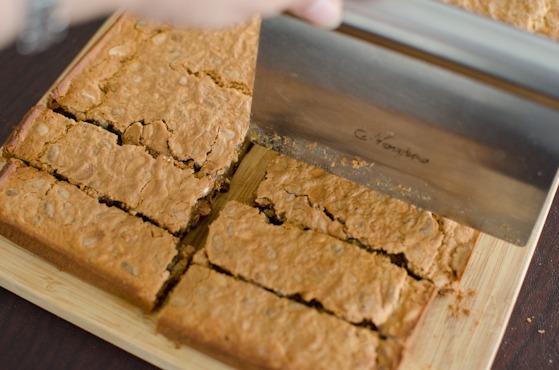 Then cut into any size bars you desire. I like my bars long and skinny. That reminds me the lyrics of the song. “Here! Take a bite!” I gave it to my kids but UNFORTUNATELY they did not like it that much. It must be too healthy for them. “You said it’s healthy. That means it is not supposed to taste good…” My little son responded after he ate half of it. Wrap these bars with plastic wrap and they will keep fresh for a few days. They can be stored in the freezer for a couple of month. They will be my breakfast, afternoon snack, and midnight munch for the next few days. And I am very happy about that. My family and I had a wonderful trip to Penang, Malaysia and Bali, Indonsia over the holidays. I will try to post some pictures soon to share with you. I had a great time and the ‘FOOD’ was just amazing in both places. Hope all of you had a great season with your family and friends over a scrumptious feast. And I wish you a very very Happy New Year! 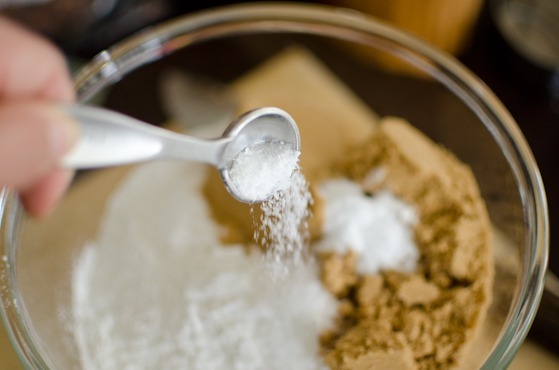 In a large bowl whisk together rice flour, brown sugar, baking soda, and salt. Pour milk and vanilla and stir to mix well. 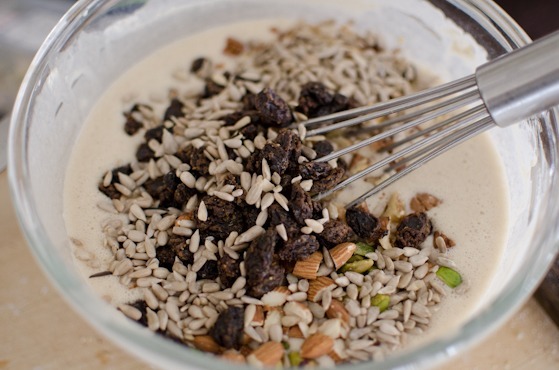 Add the assorted nuts, sunflower seeds and raisins. Mix well. Pour the batter over well greased 9x13 inch pan. Bake for 30-35 minutes until the top gets brown and crisp. Cool completely and cut into bars. 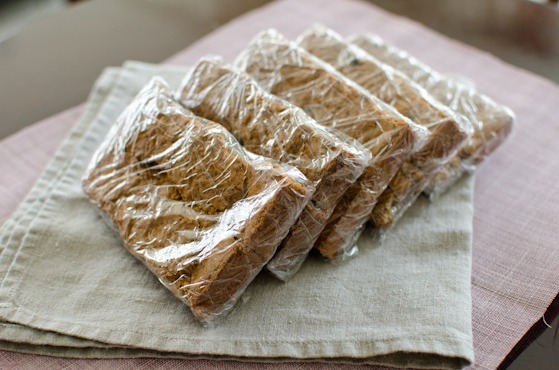 Wrap leftover bars with plastic wrap and store in the freezer. Hi Holly, HAPPY NEW YEAR! I will definitely try this recipe. Your blog is my number one on the list as I've tried many of your recipes. We were together w/ my side of the families over the Holidays and I made all of your apple desserts along w/ other dishes and everyone enjoyed very much. Thank you! Thank you Hoa. That is just fantastic. It makes me very happy to hear that. Welcome back! And Happy New Year! You're starting the year with a terrific recipe - this looks so good. Easy (and tasty!) too. Really good stuff - thanks. This is great, Holly! I love how there's no butter or oil, plus the chewy mochi-like texture sounds perfect. Definitely going to try this - thanks for sharing! Wonderful job! 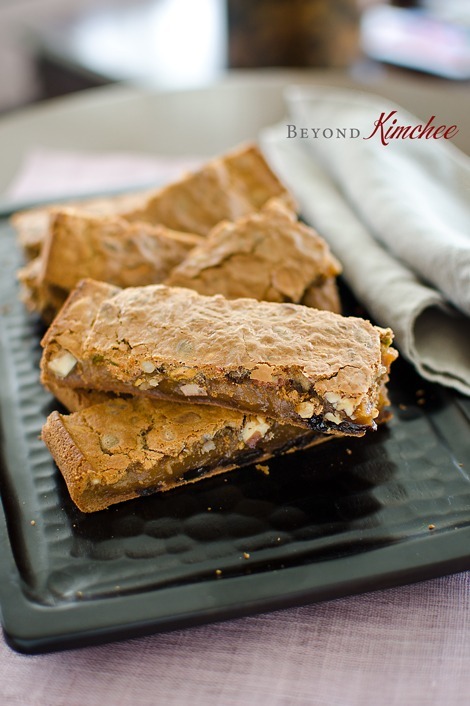 I loved your rice cake bars...would be a superhit on a kids' picnic as well! these look delicious! i've never had a sweet rice bar, but now i wish i did! the nuts must make an amazing contrast in texture. Looks absolutely amazing. Really like it that it's easy and healthy too! I am so happy to find your blog.... I love Korean food , but dont know how to make the dishes. Your recipes are easy to follow and all look so yummy. Cant wait to start !!! Can't wait to try this recipe! Did you use raw or roasted nuts for this? Or does it not matter which kind you use? It doesn't really matter. But I think if you roast/toast the nuts, I bet it will bring nuttier fragrance. Holly, this looks good! I will try it. I will be making Korean dishes this Monday to serve with for my son's Scout troop family heritage night presentation on Tuesday. 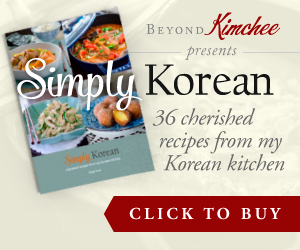 I will keep looking on your blog, but wondered if you have any suggestions for easy dishes to introduce non Koreans to delicious Korean food? I plan to make three things. All will be small samples for roughly 50 attendees. Overall, my experience with cooking Korean food is limited, but I want to expand! thanks for any advice you can provide. Hi Nancy I would suggest some of the following. They are great dishes to travel and perfect for parties. http://www.beyondkimchee.com/non-spicy-korean-fried-chicken/ http://www.beyondkimchee.com/korean-fried-chicken-2-the-spicy-version/ http://www.beyondkimchee.com/green-onion-pancakes/ http://www.beyondkimchee.com/when-chicken-marries-tofu-many-awesome-mini-patties/ http://www.beyondkimchee.com/japchae-salad/ http://www.beyondkimchee.com/korean-beef-nut-patties/ http://www.beyondkimchee.com/easy-korean-beef/ http://www.beyondkimchee.com/korean-spinach/ http://www.beyondkimchee.com/bean-sprout-salad/ Have a great time with scouts. Looks yummy. I'm going to try this out. Can I substitute the milk with Almond Milk? I'm lactose-intorelant. Thanks! Yes, Almond milk will be a great substitution to this recipe. Did you use rice flour? It should be quit thin. I wonder what type of flour you used. Yes, I used mochiko (rice flour). I looked up other sweet rice flour recipes and found that the recipes tend to require equal or more of the liquid compared to the rice flour. So, did you mean to write 3 cups of flour and 3-4 cups of milk? Jenny, I wonder it could be the rice flour itself. I used sweet glutenous rice flour manufactured in Malaysia where they consume long grains. Mochiko flour is originated from Japan and they eat short grains. I have not tried this recipe with mochiko rice flour so I can't tell how thin or thick the batter will turn out. When I tried with my rice flour it was actually quite loose. Increase the amount of milk to get the thinner consistency. 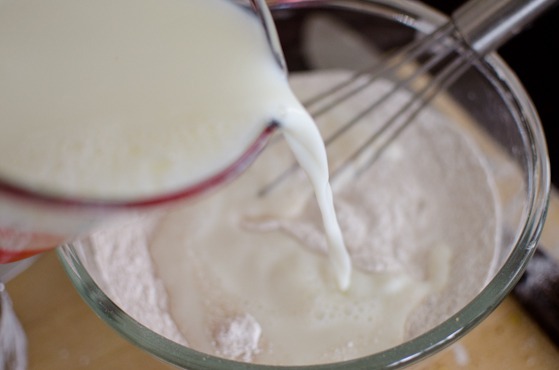 You can always pour more milk as you mix to get the right consistency. The batter should be almost like pancake batter. Hope you can give another shot. Ahhh, good to know! I didn't think there was any difference in rice flours. I appreciate the advice and will try ti again! Whether intentionally or not, you have created the perfect sports bar. High carb and protein, and low fat, this is the best for pre- and post-race snack; and unlike the branded stuff it tastes amazing! Thanks for boosting my performance! I used long grain glutenous flour so I guess mochiko flour, which is from the short grain, will need more water. I am glad that you added more water to make right consistency. Thanks for the comment. These were ssooooooo good, I put in sesame seeds and cooked red beans. Delish! This is a fantastic recipe, Abigail hit for parties and lunch boxes. Can't believe there is no butter , oil, or eggs. Hi Holly, In my quest of trying Korean food I came by your blog, and ever since I got stuck. I liked the recipes so much. You make them look easy to make that I'm determined now to try many of them - even though I'm not that much of a competent when it comes to cooking :P - and this recipe is my first. I made it, and it was so delicious. 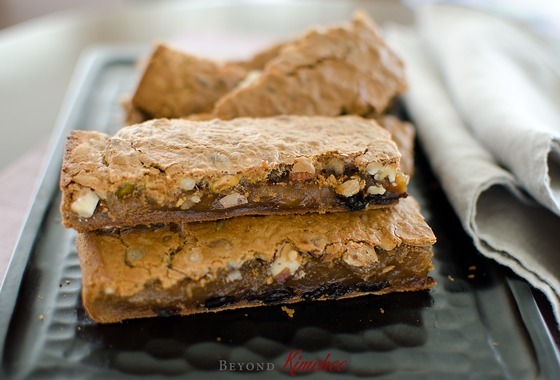 I used dates, walnuts, hazelnuts, raisins and finally the hero if them all..... dried fig. Though it didn't look like the images posted here: it didn't have crust nor it was gooey.. on the contrary: I think it was dense and wasn't that much crispy. This is how it looked: http://s20.postimg.org/3sd3ekkgd/20130726_014843.jpg What do you think are they good enough or something went wrong? Hi RosyIvory What type of flour did you use? I can see the texture doesn't look right. I wonder if you used plain rice flour, not the gluteneous(sweet rice flour). Hi Holly, Yes, it's plain rice flour - the kind available in my area - but the package said for desserts so I figured it's OK. Can I find a way around this or it's essential to make it with glutenous rice flour? Plain rice flour won't give the mochi-like chewiness and the texture. The taste would be similar, though. Yep, same thing happened to me - bought the regular rice flour at the local supermarket, and got the same texture as your bars. Nonetheless, the bars were yummy! It was a bit of a pleasant surprise, and they kept well in the freezer, too. I've managed to grab a few bags of mochiko from an Asian grocery, so I'll be attempting this recipe again with that flour. I'd heard it when I was in Korea but I couldn't remember the recipe. Now I am staying in America as a visiting teacher. I want to introduce the rice cake for my school teachers. Thanks to your recipe, I made it and shared with my school teachers. They love it. It is really great because they feel more familiar to this crispy rice cake. Thank you so much!! Given the comments from other bakers, I made sure I used a 16 oz bag of glutinous rice flour. The "batter" was more like a soft dough, not pourable at all. The rice flour bag had green writing and an elephant on it. I spread it out on the plan and baked it anyway. It came out ok but I wonder if I should have added more liquid. Hi, I think the consistency depends on the type of the glutenous rice you use, whether it is from short grain or long grain. Adding more liquid to get the right texture will help. Yes, you are right. I missed it. I also experienced same thing as you. At that time, I used 6cups of glutinous rice flour and 2cups of milk. But as you said, the batter was not pourable. So, I added more milk until it turned to be pourable. 3.5cups of milk made the pourable batter and rice cake was good. Hi Holly! I made this the other day and I absolutely loved it. I reduced the sugar to 1 cup because I used sweetened almond milk and the sweetness was perfect for me. I also used diced apricots instead of sultanas. I froze the majority of them because I'll be taking them with me to work for the next couple of weeks but I'm finding that as they defrost, the moisture makes it lose that lovely crispiness they have when they come out of the oven. Is there anything I can do to prevent this? Do they keep in the fridge or does that make them soggy as well? Hi Barbara Glad to hear that you love this bar recipe. In order to answer your question regarding sogginess of the bar after freezing, did you individually wrap them tightly with plastic wrap? With any baking goods, it is always crispier when freshly baked. Once it has frozen and thawed, it looses its fresh crispness a little due to the moisture in the freezer. In order to minimize that you will need to wrap them individually very tight with plastic wrap, then store in another airtight container or ziplock bag. Another way to help to restore the crispness is to reheat in the oven for a few minutes. But that might not be so convenient for you if you have to take them with you. Hello, I made the rice bar but only the top came out nice and crispy as yours. The bottom however, remains so sticky that I had problem getting the rice cakes out of the tray after baking. Please advise what went wrong? Taste wise, it's delicious! Did you grease the pan before you add the batter? This bar will have crispy crust but sticky inside. Hi Holly, yes I greased the pan with oil before pouring in the batter. But no crust was formed at all on the bottom and side. I had to scrape the pan to get the rice cake out. I wonder if the batter was too loose. Depends on the type of sweet rice flour, some needs less liquid. Next time you make it, try less amount of milk. Ok, I'll add less milk next time I try this again. Tks! I just made these and they are soooo good! I used coconut sugar since I was out of brown sugar. I also used ground up walnuts (almost like nut meal) because I accidentally over crushed my walnuts and it still came out delicious. Also used mochiko flour and used 3 cups of milk as suggested in the recipe and it came out perfect! 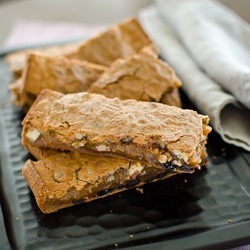 This is such a great recipe, thank you! I will definitely make it on a regular basis.